1. Wash and rinse pint or half-pint canning jars; keep hot until ready to fill. Prepare lids and screw bands according to manufacturer’s directions. 2. Wash cherries well under running water; remove stems and pits. Cut cherries in half. 3. Measure 5 cups of pitted, halved cherries into a 4-quart Dutch oven. Stir in water. 4. Heat over medium-high heat while stirring to prevent sticking and scorching. 5. Simmer until cherries are softened enough to mash with a potato masher, about 8 to 10 minutes. 6. Mash cherries, then stir in 2 cups sugar thoroughly. 7. While stirring over high heat, bring to a full boil that cannot be stirred down. Boil 1 minute. 8. Remove from heat. Stir in complete pouch of liquid pectin until thoroughly combined. 9. Skim foam from top. 10. 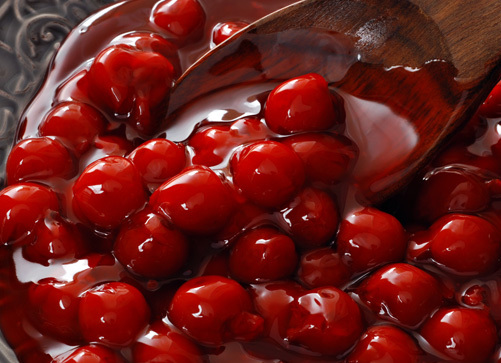 Pour hot cherry topping into clean hot jars, leaving ½-inch headspace. 11. Wipe jar rims with a clean, dampened paper towel and adjust two-piece metal lids and bands.